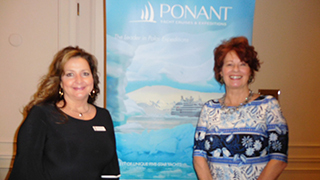 Theresa Gatta, vice president of sales at Ponant and Vanessa Lee, president of Cruise Strategies Ltd.
Edward Infanti of Cruise Experts Travel Ltd. and Ellen McIlvaine, director of business development for the Northwest at Ponant. 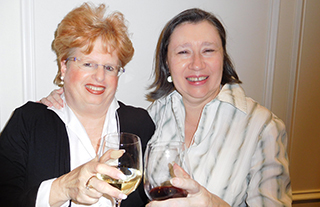 Jane Woodward of Sunrise Travel Services and Brenda Kerr of Travel Agents in Action. 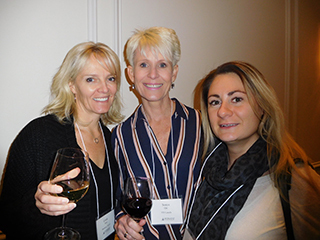 Linda Sin of Renshaw Travel, Sonya Orr of TTi Travel, Jessyca Georgison of Renshaw Travel. Ponant’s new ‘Blue Eye’ lounge. Big things are happening at Ponant Yacht Cruises & Expeditions. From a host of new ships featuring the world’s first multi-sensory underwater lounges and the implementation of unlimited complimentary WiFi across its entire fleet, to its continued environmental commitment and the building of a hybrid icebreaker vessel that’s powered by liquefied natural gas — the company has its eyes fixed firmly on the future. Representatives from the small ship expedition specialists held a cocktail reception at Vancouver’s stylish Hotel Georgia this week to update the region’s travel agents on all the latest developments. That means that the cruise line—which specializes in destinations inaccessible to larger ships, such as Antarctica, the Orinoco and Papua New Guinea -- will be offering an incredible 460 departures across seven continents by 2021. 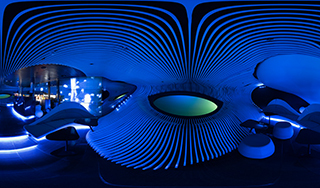 However, the jewel in the crown of Ponant’s new EXPLORERS series of yacht-like ships has to be the ‘Blue Eye’ lounges, which allow passengers to experience the underwater world via two portholes in the shape of cetaceous eyes that look out into the marine world. 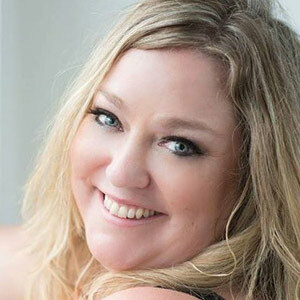 “This is a space that is about three metres below the waterline,” explained Ellen McIlvaine, Ponant’s director of business development for the Northwest. “We shine a bright light outside that attracts the fish and animals to come and check us out. It’s beautiful. Gatta went on to explain that the average age of a Ponant cruiser is 58, and that many of them have previously done river cruising. She added that the average commission on a booking is around US$2,400 to US$2,500 -- so it’s well worth taking note of Ponant’s current booking incentives, which include early booking offers of up to 30% off; zero single supplements on almost 40 itineraries; group savings of 5% for parties of five and over; and a $200 gift card for agents who sell Ponant for the first time. 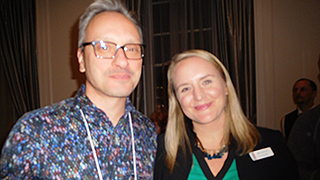 Any chance I could get a copy of the photo of myself and Jane Woodward that was taken at the Ponant event in Vancouver a few weeks ago.